"You're not just running, you're preparing for the zombie apocalypse." Exercise games, AKA "exergames" are a strange breed. While they're often well-made, people rarely seem to stick with them after the initial appeal wears off. Granted, there are exceptions like Wii Fit, but they're few and far between. However, a couple of independent developers are working on making a title that will not only be a solid exergame, but will retain its user base by staying fun. The game, City of Epic, is being designed by BitBot Media, the brainchild of Katherine Ramos and Kelly Maguire. At the moment, it's a proposed project on Kickstarter, the crowdfunding site that lets people support a wide array of projects, artistic and otherwise. You've just fallen off the turnip truck in Epic, a big city where all the inhabitants are inexplicably obsessed with Awesome. But Awesome isn't just a concept here; it has physical form as AwesomeTokens, AwesomeStars, and the highly coveted AwesomeCubes. In short, your status revolves around how much Awesome you have. Since everyone in Epic is already incredibly intelligent and attractive, the most impressive thing you can do is show off with feats of strength and stamina. Gain enough status, and they might just elect you Mayor of Epic. From the sound of things, the game will assign exercise tasks to players based on story scenarios. 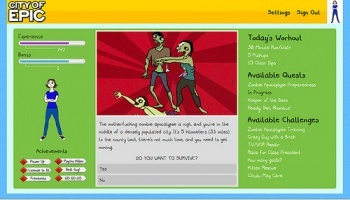 My favorite example is shown in this screenshot, which announces that the zombie apocalypse is taking place, so players have to run 5K (3.1 miles) to the county limit in order to survive. Ramos and Maguire are asking for $5,000 to get the project done, of which they've collected almost $1,500. If you want to help fund the project, head to the link below. Remember, you're not just helping nerds get in shape, you're helping ensure that some people will be fit enough to survive the end of the world.